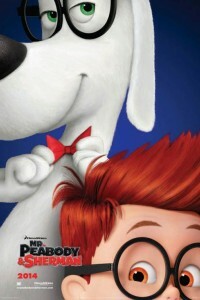 The genius canine Mr. Peabody and his adopted human son Sherman spring into action when Sherman uses their time machine without permission and moments in history begin to be changed, in the big screen version of Mr Peabody And Sherman. Using his most ingenious invention, the WABAC machine, Mr Peabody and his adopted boy Sherman hurtle back in time to experience world-changing events first-hand and interact with some of the greatest characters of all time. They find themselves in a race to repair history and save the future.